The prevalence of cancer is increasing worldwide. Globally, 14 million people are diagnosed with cancer each year, and approximately nine million lose their lives to cancer annually. Four of those nine million are aged between 30 and 69 years. According to the Cancer Association of South Africa, breast cancer in women and prostate cancer in men are among the top five cancers prevalent in South Africa. However, according to the World Health Organization, between 30 and 50% of all cancer cases are preventable! It is therefore crucial to constantly emphasise cancer awareness and alert people to strategies that address the burden of this disease. 4 February is World Cancer Day. This initiative by the Union for International Cancer Control provides an opportunity to enhance cancer awareness and to report on the current status of cancer statistics in relation to global health. Breast cancer and leiomyosarcoma have been diagnosed in several of my family members and friends over the years. This has led me to the conclusion that cancer needs everyone’s attention. We have to be alert; taking risk factors into account. Everyone can contribute towards cancer mindfulness to overcome barriers to early detection, cancer treatment and palliative care. Public awareness of risk factor is crucial. Fundamental risk factors include acute/chronic stress, alcohol consumption, tobacco products, diet, lack of physical activity, environmental pollutants, ultraviolet radiation, reproductive and hormonal factors, occupational exposures, genetic predisposition to cancer, and infection-attributable cancers. In addition, symptomatic cancer presentation also remains one of the most prevalent means of cancer diagnosis. Cancer is defined as a malignant tumour caused by uncontrolled and abnormal cell division. If this is not treated, these malignant cells may metastasise to other parts of the body via the blood stream or lymphatic system. Traditional cancer treatment options include surgery, chemotherapy and radiation. Cancer patients may receive only one type of treatment, but a combination of treatments including surgery with chemotherapy and/ or radiation therapy may be decided on. In recent decades, considerable progress in cancer cell biology paved the way and advanced technology for early cancer detection, screening and surveillance in modern oncology. Cancer treatment approaches may include immune modulating drugs, antibodies targeting and destroying the cancer cell per se, hormone therapy, epigenetic drugs that regulate genes causing cancer, vaccines, cell cycle checkpoint inhibitors, and cell-based therapy. The principle of stem cell transplants is based on restoring blood-forming stem cells in cancer patients when their blood-forming stem cells have been destroyed due to high doses of chemotherapeutic drugs or radiation therapy. In recent years, precision medicine or personalised medicine in cancer treatment has evolved. Precision medicine aims to deliver individualised ‘precise’ treatment to patients. Precision medicine in cancer takes into account the genetic, molecular and biological characteristics of the patient that subsequently influence the treatment selected by physicians. Although there is currently no consensus about personalised/ individualised cancer treatment, it is envisaged that precision medicine will contribute to the development of therapies that will target the cancer cells or cellular pathways affected with minimal trauma and side effects, to improve quality of life. There is definitely also no ‘one-size-fits-all’ treatment for cancer patients. While huge strides have been made with regard to the medicines available, a caring environment nurturing the discovery of new knowledge to contribute to the fight against cancer is also imperative. There are millions of cancer survivors worldwide, again emphasising the importance of cancer awareness, early detection and treatment. For each of us that starts promoting cancer mindfulness, there is increased hope that what will happen next might just change the world. 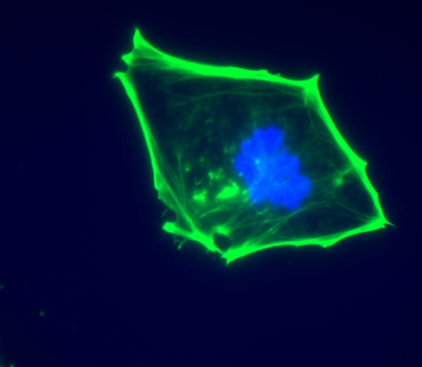 Above: Cancer cell without treatment with a potential anticancer agent. 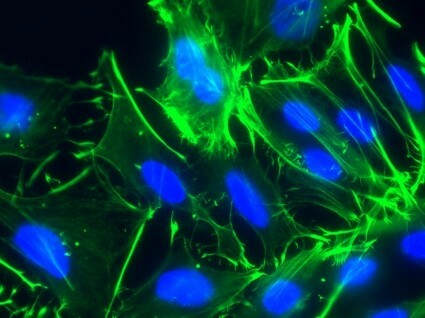 Below: Cancer cell response after treatment with a potential anticancer agent. Professor Annie Joubert is Head of the Department of Physiology at the University of Pretoria. Professor Joubert’s research focus is cancer cellular physiology. She studies cancer drug design and cancer cell signalling to identify targets for therapeutic intervention in the fight against cancer.